This large capacity washer has all of the advanced technology that you can find in an energy saving washing machine. The Kenmore Elite HE5t Steam washer has the ability to wash up to twenty five bath towels in one load. The machine exceeds the Energy Star qualifications by a far margin making this the ideal energy saving machine for your home. This allows you to save money on your energy bills as well as your water bills by decreasing the amount of water that is needed to wash a load of laundry. The Kenmore Elite HE5t Steam washer will allow you to treat your stains with both steam as well as timed Oxy. The machine has a detergent, bleach and fabric softener dispenser in the machine as well as a number of special cycles for all of your fabrics. The steam feature also allows for a sanitizing feature for your laundry as well. This will work on all the fabrics in your home, even your pets bed. In all this is a top of the line Kenmore washer. 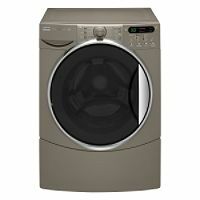 The Kenmore Elite HE5t cu washer is the best choice for those that have a large family or are in need of the very best in stain fighting ability. The machine uses steam for some of the best stain fighting and the timed Oxy cleaning will get out whatever the steam does not. This is the ideal for those who have stain makers in the family like children. The large capacity on this machine allows you to save a great deal of time on your laundry. This makes it a good choice for busy families with a lot of laundry. The water that is used in the machine is minimal and the spin cycle will efficiently remove most of the water from your wash allowing for a faster dry time. Expect the cycle to take a bit longer when you are using the steam technology on the heavy duty cycle. This allows for all your clothes to come out sparkling clean. Make sure that you have the room for the larger washer in your laundry room. The front loading feature of the machine should be taken into consideration as well when you are determining your space requirements. It is also recommended that you leave the door open on the machine to avoid odor or mold in your front loading washer. There is nothing that this machine cannot handle in your home. Comforters, drapes and the bedding for a large bed will all fit in this machine and cut your laundry time in half. Along with shorter piles of laundry, you will also get much cleaner laundry in the process. Comments for Kenmore HE5T Steam 4.4 cu. ft. Expecting a reliable washing machine that cost $1,600 + USD should be an easy thing. Sears Kenmore is poor quality, has poor warranty ... bought the $ 140 2 year warranty then extended it another 3 years $ 200. These were valuable since multiple problems happened. The "wings" in the washer drum would come detached on a regular basis. On and off other problems. For a relatively light used washer (1 load a week) now I'm facing a $ 500. repair bill for a water pressure sensor service call & replacement. Samsung or LG is looking really good right now. Bought this washer in August 2008, had to replace the seals in 2010 and now the clothes have a moldy smell after washing becuase the drums have gone bad. The cost to replace the drums are more expensive than a new machine. I paid over $1500 for this machine and got less than 4 years out of it. I will never buy another kenmore product. Never buy the Kenmore Elite washer/dryer set!! We bought the Kenmore ELite HE5T Steam washer/dryer set from Sears 3 years ago. The service tech just came out as it's making a horrible noise during spin. He said the main bearing is out and the cost for repair is $1400 !!! Clearly we would never invest this kind of money in a Kenmore applicane again. I bought this very expensive washer and 1 day after the warranty expired we start getting error codes and can't wash a load. Serviced every part we could find and still no luck. We called sears and they won't tell me anything because we were 1 day out of warranty. They will only schedule service at 140.00 just to look at it. PLEASE DON'T BUY THIS WASHING MACHINE. This machine doesn't let the water get hot, it doesn't have enough water to get the pockets of your pants wet and it doesn't dispense all the laundry soap into the machine. Sears will sell this as the largest strongest on the market, but it can't even the smell our of our clothes. The clothes are not clean and if you ever get one flea in your home, count on throwing away everything you own. This is a horrible wash machine but Sears is proud of the price tag. They will tell you sorry for your bad luck. I purchased 2 of these washers 2 years ago and only use them about 10 weeks a year as they are in a vacation home. Both washers have had to be serviced for bad sensors and the controller board just went out in one and will cost over $400 to fix. Sears has been very difficult to work with from the beginning with warranty coverage and now that they are out of warranty, unwilling to help us out in any way. I will absolutely never buy another appliance from Sears due to the poor customer service I have received.